Fake stories of Bitcoin casino winnings luring unsuspecting Canadians. The online gambling business has always been wrought with fraudulent activity. For every upright casino on the internet, there’s a rogue operator out there preying on the vulnerable. Now, it’s not just the unsavory operators we have to worry about, but fake news publications luring unsuspecting Canadians into investing in Bitcoin scams. Bitcoin is a cryptocurrency that has one very similar thing in common with real coins. There are two sides to all of them. One the on hand, digital currencies have done wonders for the iGaming industry, providing a secure and anonymous way to move money. On the other hand, they’ve opened the doors wide for money laundering, scams, and other duplicitous activities. The headlines have lit up recently with Bitcoin news, mostly revolving around price fluctuation. At one point in 2011, a single Bitcoin was worth US-$0.30. The value has skyrocketed since, worth over $19,000 at its peak in December 2017. It then dropped dramatically over the next two months, currently worth about $10.4k (at time of writing). 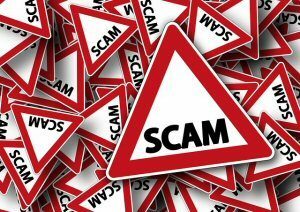 All this activity in the market and media has caused scam artists to capitalize on its volatility and the vulnerability of those who are constantly hearing tales of overnight Bitcoin millionaires. Canadians are especially being targeted. Falling victim to a Bitcoin scam is a lot more common these days. Not because everyone dreams of becoming suddenly rich, but because fake news stories, and fake news websites, are convincing people that it’s real. 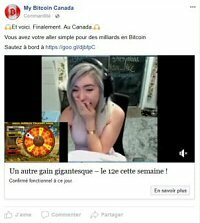 Just this morning, Radio-Canada uncovered a fake story of Bitcoin casino winnings, blowing the whistle on an international network of duplicitous news and ad campaigns. According to their findings, these fake ads are convincing people to invest $10 for a “virtually guaranteed” profit 2500% or more. The fake article urges people to spend $10 to register at a Bitcoin casino. They claim that in doing so, the user is actually investing in Bitcoin, and that they are “virtually guaranteed to make [sic] at least $250”. My Bitcoin Canada published a story on January 31, 2018 on its Facebook page, with the tag line: “Et voici. Finalement. Au Canada. 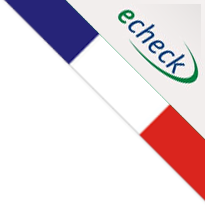 Vous avez votre aller simple pour des milliards en Bitcoin”. Translated into English, that reads: “And here. Finally. In Canada. You have your one way for billions in Bitcoin”. Clicking on the link provided sent users to a sketchy news site, called Tribune News Now, that relates the story of a Quebec man who supposedly spent his last $10 registering for the Bitcoin casino, then turned it into $13 million. The article goes on to boast: “Si vous êtes québécois, vous êtes sur le point de devenir vraiment riche : ce casino Bitcoin est une véritable vache à lait et les résidents canadiens se font des millions”. English translation: “If you are from Quebec, you are about to become really rich: this Bitcoin casino is a real cash cow and Canadian residents make millions”. Note: That same link now redirects people to a different website that claims to sell Bitcoins. That website was registered less than 60 days ago, and does not utilize “https://” security. I won’t even mention the link to it, because it’s too sketchy! Upon investigating the Bitcoin casino in the advertisement, Radio-Canada found that it advertises none of these things. It does not boast about big winners. It does not promise, or “virtually guarantee”, that a $10 deposit will turn into $250. The only information that rang true was that fact that members must pay a $10 registration fee just to sign up.